Albert and David Maysles, pioneers in the cinéma vérité movement of documentary filmmaking, chose for their subjects of this film a mother and daughter with celebrity connections. Edith Bouvier Beale and her daughter Edie (or, as they are called by the brothers, Big Edie and Little Edie) are aunt and cousin to Jacqueline Kennedy Onassis. In the early '70s, their 28 - room mansion in Long Island's tony community of East Hampton was found to be a health hazard, and the two women, in their seventies and fifties, were threatened with eviction. Jacqueline Onassis paid for the house to be put in good order, and two years later, the Maysles paid the ladies a series of follow-up visits. This is not fly-on-the-wall filmmaking; the brother are sometimes shown on camera, and both women talk directly to them. 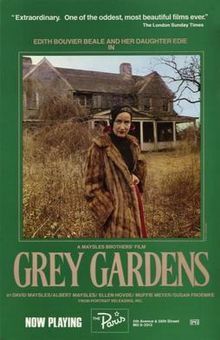 Big Edie reminisces about her husband (from whom she has long been separated) and her youthful singing career, Little Edie ruminates over memories of her thwarted romances and confides that she has to get out of Grey Gardens (the name of their estate), although she has been living there since 1952, and the two women pick at each other for transgressions past and present.